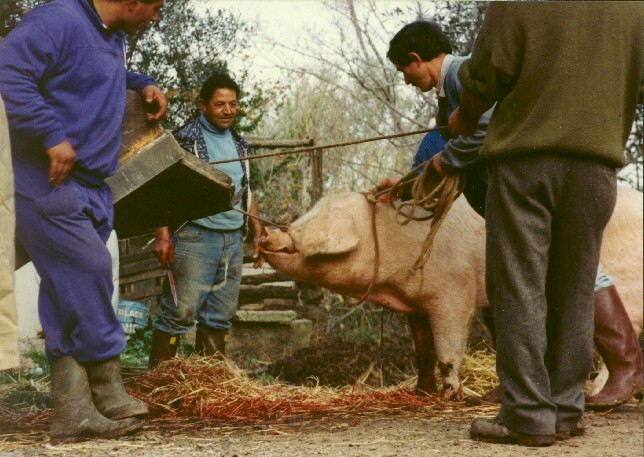 A look at a traditional Calabrese pig slaughter with a modern twist. 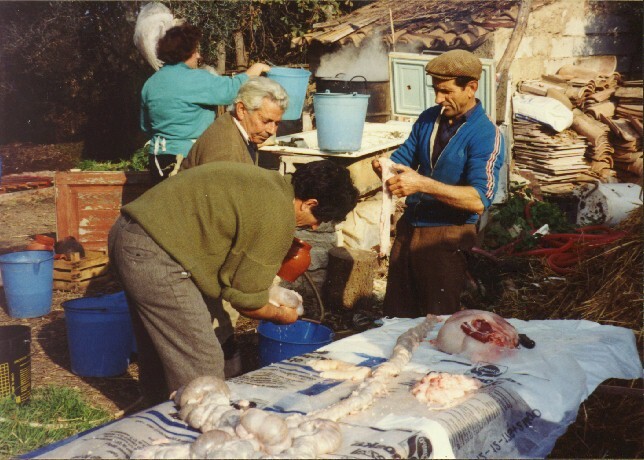 In January of 1992, I took a vacation to Calabria to visit my family who still reside there. To mark the occasion, my family slaughtered a pig and I was able to catch most of it on film. The images are a bit graphic, so a word of caution for those who may find this disturbing. 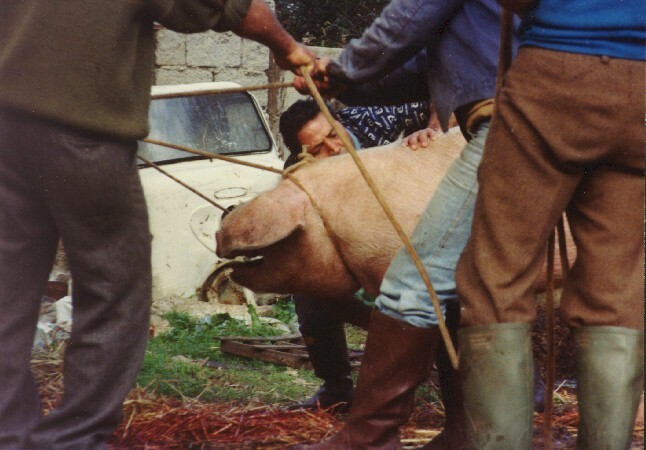 The first thing they did was tie two ropes around the pig--one around its neck and the other around the upper portion of its mouth. 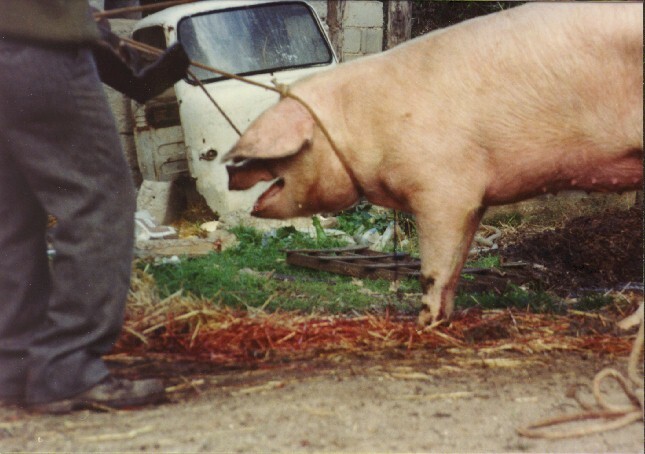 The first rope is used primarily for restraining the pig and the other around its mouth is used to "weaken" the pig. 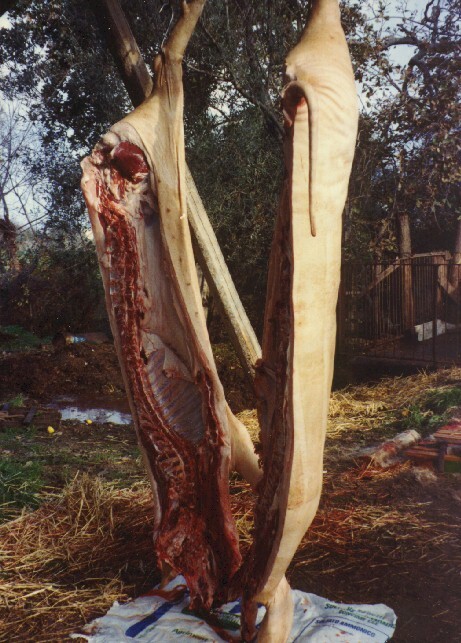 Once the pig is subdued, the incision is made in the neck of the pig. The straw below it keeps the blood from staining the ground and alerting future pigs of their impending demise. The pig is now furious and thrashes wildly in a futile attempt to escape. While the men are holding the ropes, they attach the other end of the ropes to a bulldozers scoop which has spikes. Which will be used to hoist the pig once it begins to get too weak to stand. At this point the pig begins to realize the end is near so it peacefully accepts its fate. 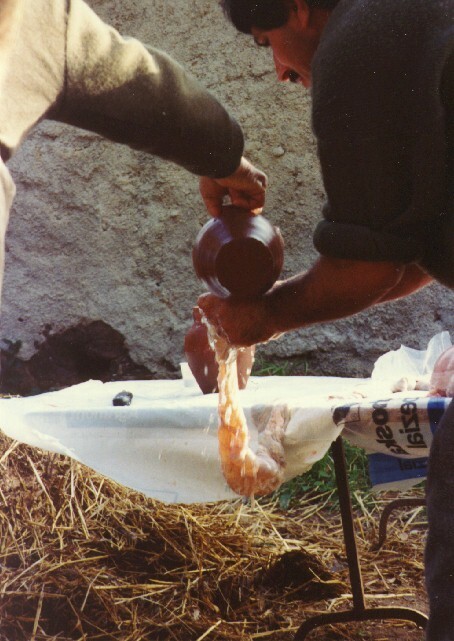 Then a shallow pan is placed under the trickle of blood (not shown) to capture some for the making of sanguinaccio (blood pudding). Once the pig collapses and dies, steel hooks are attached to its rear feet and the hooks attached to the spikes of the bulldozer. 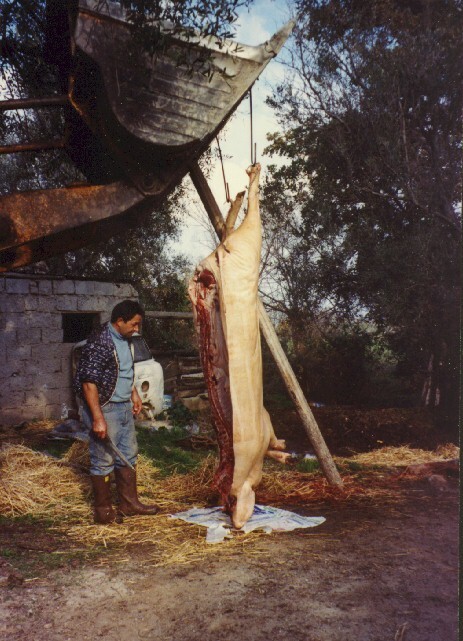 The scoop is then raised high to hoist the pig vertically. Then the pig is split open down its center and all the organs are removed and placed on a table for subsequent cleaning and preparation. Then the job of carving the meat begins. 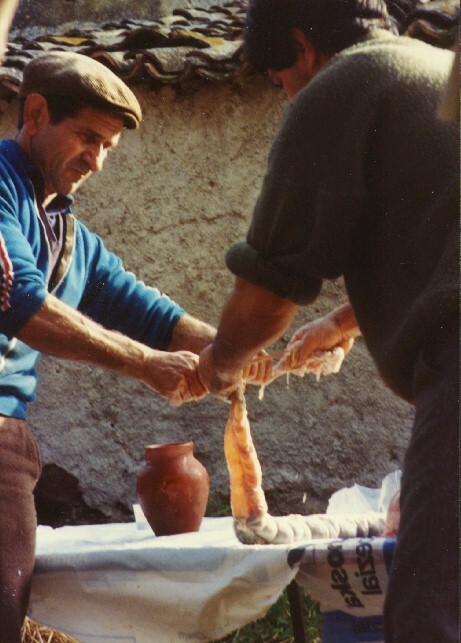 Portions of that meat are used as a filling for the sausages and salamis that will soon be made. The rest is split up among the family for later consumption and for the feast of that evening. Now the organs are cleaned externally. The intestines are tied at one end and then emptied of their contents. Once emptied, they are turned inside out. Now they are cleaned externally once again. Once this is complete we have an empty casing that is cleaned both inside and out. Then the meat that was cut is put into a grinder. Once ground up, spices are added to the meat and mixed in. Then the ground meat and spices are put back through the grinder, with the empty casings at the opening of the grinder to catch the meat. 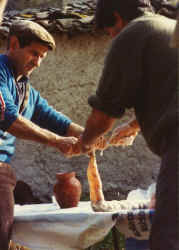 Once filled, the casings are tied off at whatever intervals are desired. 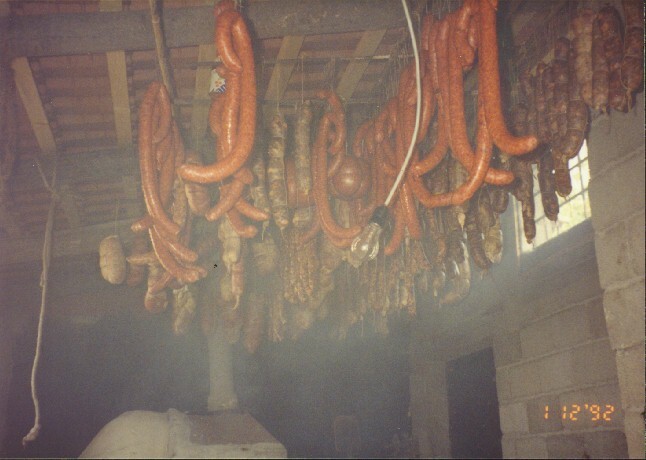 After all is done, the new sausages and salamis hang to dry until they are ready to eat.